Chelsea boss Carlo Ancelotti believes that his side have put their worst run of form in a decade behind them after a 1-1 Premier League draw at Tottenham. The Blues have won once and scored only four times in their last seven league games, but are one point off the top. "I think we are on the right way. We deserved to win. We were very close, we will win our next game," he said. "We have a lot of possibilities when we recover all our players. I think this difficult moment is on our back." The champions could have led the table, at least until Monday evening, had Didier Drogba converted an injury-time penalty, but the substitute was denied by Spurs goalkeeper Heurelho Gomes. Ancelotti said the performance against their London rivals should give his side the belief to mount a renewed assault on the summit. "We have to be happy because we played well against a strong team away and we had a good performance," the Italian added. "In the second half we had the possibility to win, we were unlucky. "We missed a penalty but the performance was good so we have to look forward with more confidence now." Ancelotti stressed that regular penalty-taker Frank Lampard, who made his long-awaited comeback from injury as a substitute in the match, had not trained sufficiently to take the late spot-kick. The Chelsea boss also defended his decision to omit Drogba from the starting line-up. 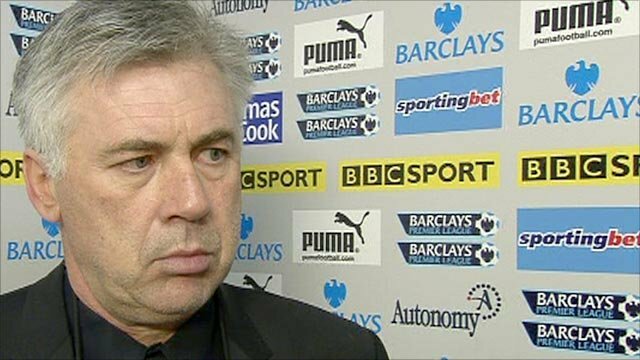 "I wanted to use a counter-attack for the first half and for this reason I put Anelka up front," Ancelotti continued. "Second half was different, we needed to come back into the game and Drogba played very well because he used his ability and his power for the team." Chelsea will attempt to recover their previous form against title rivals Manchester United and Arsenal on 19 and 27 December respectively. Ancelotti's men opened the defence of their crown in free-scoring form, netting 21 times en route to five successive victories. However, with key figures such as Drogba, Lampard, John Terry, and Michael Essien spending enforced spells on the sidelines, Chelsea have failed to maintain that blistering pace in recent months. A five-point lead at the top of the table at the start of November has evaporated, with the west Londoners now trailing league leaders Arsenal and second-placed Manchester City by a point. Ancelotti's Tottenham counterpart Harry Redknapp also backed Chelsea to find their feet after an entertaining encounter at White Hart Lane. 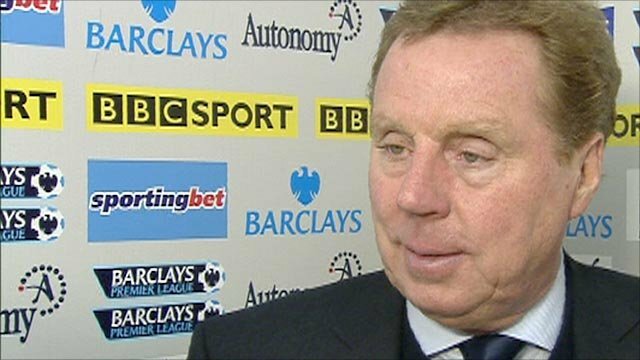 "You will see Chelsea come strong now I think," Redknapp predicted. "They have got Essien back, they have got Lampard, they have got Terry back and when they are all fit they are the champions." Having weighed his side's late penalty reprieve against a hint of handball in the build-up to Drogba's equaliser, the Spurs boss felt that both sides deserved a share of the points. "It was a handball, but his actual strike was a powerful strike," Redknapp reflected on Drogba's goal. "Normally you would have saved that but Gomes has made up for it with his penalty save. "I think we have come off all feeling it was a fair result in the end. "Our keeper has not had that much to do considering in the second half they had an awful lot of possession. "They had us penned in for long periods but the keeper has only had one or two efforts to save."